Websites sponsored by The Carter Center have become an important portal for political reform in China, engaging their audiences with news articles translated into both Chinese and English and offering a platform to debate current affairs in a traditionally closed society. The goal of the websites, www.chinaelections.org (Chinese language) and www. 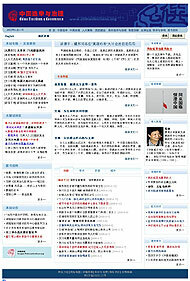 chinaelections.net (English language), is to promote better governance and elections in China. "The website is quite famous in China," said Yawei Liu, director of the Carter Center's China Program. "People go to the site because they know they can get up-to-date news and commentary. Other similar sites have been shut down." When articles are posted that contain sensitive words, the Center receives a phone call asking that the offending article be removed. Noncompliance results in the disabling of the site, meaning it cannot be viewed in China. "We are observant of the line," said Liu. "We pull back when requested by the censors. Our goal is to encourage debate about democracy while respecting the Chinese government's policies." The Chinese-language website features Western literature on democracy translated into Chinese as well as commentaries on current events to encourage debate. Its audience is government officials, university faculty, students, and others interested in political reform in China. About 200,000 people visit the site each month from within China. The Center tracks which articles are the most popular. Currently, the mostviewed articles deal with recent elections in Taiwan. "Initially, we wanted a one-stop website for those interested in elections and governance in China," said Liu. "But as the site grew it became a platform to encourage debate on multiple issues. It's exciting to watch it develop." The English-language website highlights news articles from both Western and Chinese media sources. Carter Center interns translate important Chinese articles into English - stories on political reform, democracy in China, and commentaries - accounts that a Western audience may not typically see. "We try to bridge the media gap," said Liu. "By bringing both sides of the debate to one place, people can make up their minds for themselves." The Center also sponsors http://www.chinarural.org/, the most comprehensive website on village elections and villager self-government in China. English-language and Chinese-language websites sponsored by The Carter Center provide a place for debate about political and democracy issues in China. Results are tallied following elections in Shidong village, China, in 2006.